Music by Philip Glass. Libretto (French) by the composer based on the film by Jean Cocteau. 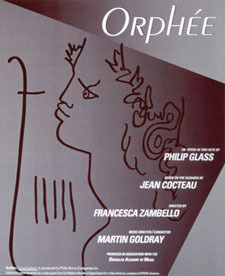 Based on Cocteau’s fascinating retelling of the Orpheus myth, Orphée, the first opera of Philip Glass’ Cocteau Trilogy, is an extended parable on the life of an artist, a poet harassed and misunderstood by peers. His success leads to the ridicule by fellow poets, ending in a creatively crippling isolation. With a renewed apprehension of his own mortality, Orphee regains his emotional stregnth, enabling him to ignore the trials of ordinary life, freeing him to be a poet. The poets Orphee and Cegeste, Euridice, and a mysterious Princess interact within the worlds of the living and the dead, existing in that mysterious realm that separates the two worlds. Love triumphs and thus returns Orphee and Euridice to mortal life, with no remaining consciousness of their unusual time spent between “the worlds”. The Princess has violated the laws of life and death one time too many and is banished into oblivion.